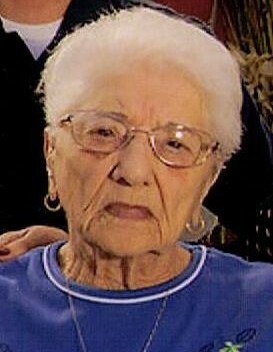 Edith D. “Edie” Vallis, 98, of Mingo Junction, Ohio passed away Thursday March 28, 2019 at Sienna Skilled Care in Wintersville, Ohio. She was born October 24, 1920 in Steubenville, Ohio, a daughter of the late Eustachio and Thomasine (Madama) Campana. In addition to her parents, she was proceded in death by her husband, Dominick Vallis; a grandson, Anthony Flowers; eight siblings, Anthony Campana, Mary Posar, Annie Benos, Albert Campana, her twin Gene Campana, Joseph Campana; and two infants Albert and Joseph Campana. Edie was a homemaker and she loved playing Bingo. She was a member of St. Agnes Catholic Church. Surviving are two daughters, Thomasine Flowers of Perry, OH and Barbara (Gary) Hauck of Mingo Junction, OH; three grandchildren, Lori (Rob) Jefferson, Brandon (Jean) Hauck, and Leigh Ann (Brian) Krager; and six great-grandchildren, Matthew Blackett, Ava, Evan and David Hauck and Layla and Olivia Krager. Friends will be received at the Wheeler Funeral Home, 101 Longview Ave., Mingo Junction, on Sunday from 1:00 p.m. until the time of her funeral services at 3:00 p.m. with Rev. Fr. James M. Dunfee, officiating. Private entombment at Mt. Calvary Cemetery, Steubenville, OH. Memorial contributions may be directed to Valley Hospice, Inc., 10686 State Route 150, Rayland, OH 43943.